A new class-action lawsuit filed against AT&T has accused the carrier of measuring data use for the iPhone and iPad "like a rigged gas pump," and asserts that the company overstates web server traffic by as much as 300 percent. The complaint from Patrick Hendricks of Alameda County, Calif., claims that the plaintiff and his counsel hired an independent consulting firm to assess AT&T's billing practices for data use. The analysis allegedly found that AT&T's bills "systematically overstate web server traffic by 7% to 14%." In some cases, that traffic was said to be overreported by more than 300 percent. As an example, the suit claims that an iPhone user on AT&T's network who downloads a 50KB website would usually be charged 53.5KB for a 7 percent overcharge. If the data were to be calculated 300 percent higher, it would register as a 150KB use of bandwidth. The lawsuit also alleges that AT&T "bills for phantom data traffic when there is no actual data use initiated by the customer." The independent consulting firm hired by Hendricks allegedly took a new iPhone, disabled all push notifications, location services, had no e-mail account configured, and closed all applications. Over 10 days, the phone allegedly used 2,292KB of AT&T's data plan. "This is like the rigged gas pump charging you when you never even pulled your car into the station," the complaint reads. AT&T is the only defendant in the suit, which does not target Apple. The suit also asserts that AT&T's billing system does not accurately record the time and date when data usage occurs. This, Hendricks argues, makes it more difficult for customers to monitor their data usage, or spot potential overcharges. Hendricks is an AT&T customer with an iPhone, and he has the carrier's low-end 200MB data plan for $15 per month. The suit states that in his billing period for the October-November period of 2010, he used 223MB of bandwidth, incurring a $15 additional charge. "Many of these charges were for phantom data transactions that either never happened or were never initiated or experienced by Mr. Hendricks," the complaint reads. "The remainder of these charges were systematically inflated in terms of the actual amount of data used." AT&T responded to the complaint and noted that it had only recently heard of the lawsuit, filed on Jan. 27. "We intend to defend ourselves vigorously," a company spokesman reportedly said. "Transparent and accurate billing is a top priority for AT&T." 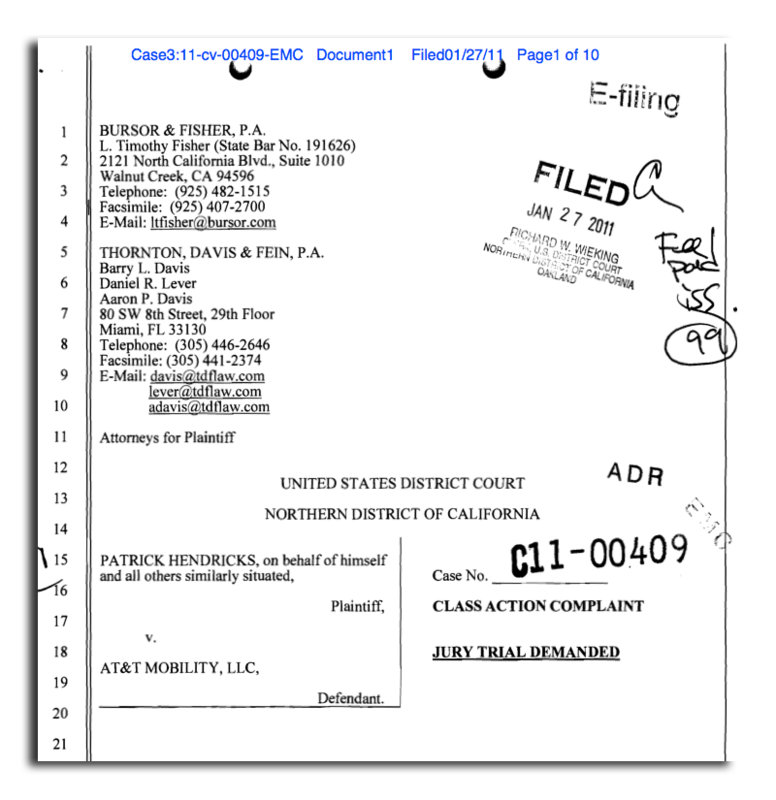 The complaint attempts to prove that AT&T has wronged the class-action party on five counts, including breach of contract, unjust enrichment, and unlawful, unfair and fraudulent business practices in violation of the Unfair Competition Law in the California Business and Professions Code. The suit seeks compensation for the alleged data overcharges, as well as punitive damages for the company's claimed practices. AT&T began capping new iPhone and iPad data plans last June, with a new tiered structure that offers 2GB of data for $25 per month, or 200MB for $15 per month. The company has also reportedly been offering potential Verizon iPhone switchers the ability to reenable unlimited data on their plan.